Our Forest School leader is Miss Sarah Evans. 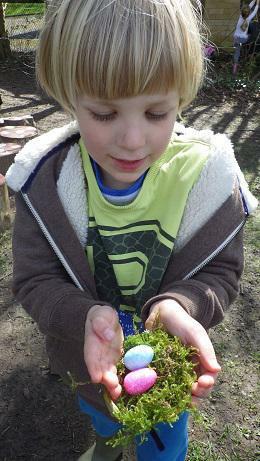 This term we have been blessed with unseasonably good weather for most of our Forest School sessions. Autumn has however now firmly set in and the leaves on the trees are an array of beautiful colours, which we have used to our advantage in our Forest School sessions. The Forest School area is opening up as the leaves fall from the trees and the final cow parsley stalks disappear. Falcon Class have taken full advantage of the changing season, creating some lovely art work with the colourful autumn leaves. We also talked about hedgehogs and how we can help them. Some children made clay hedgehogs and used natural materials for the spines, before creating their own habitat for their hedgehog. We also discussed nature's Superheroes and tried to find some in our Forest School area - Spiderman and Exoman (woodlice) were some favourites! Merlin Class started the term by helping to tidy up our Forest School area. 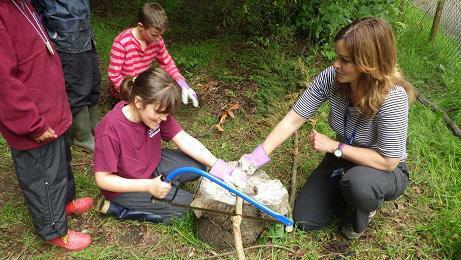 They learnt to use loppers and secateurs safely and respectfully. We also embraced their class topics of the Greeks and the Solar system and they created some amazing and imaginative work using natural resources. This ranged from a solar system necklace using wooden disk to a Greek God costume complete with a beard made from leaves! 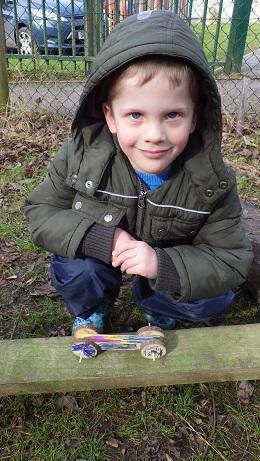 The children enjoyed having the freedom to come up with their own ideas and worked brilliantly together. Our new Nestlings were introduced to the Forest School area for the first time and have spent the term exploring the area, developing their social skills and trying new things. They enjoyed looking at minibeasts and trying to match the autumn colours with our colour charts. Merlin class and Falcon Class will end the term with a treasure hunt and fire session (weather permitting), learning about fire safety and toasting their own marshmallows. Throughout our Forest School sessions we aim to help the children to increase their confidence, self-esteem, perseverance, risk taking and respect for nature though a variety of outdoor child led activities. There are plenty of opportunities to explore nature in a variety of ways whilst having lots of fun and showing respect to our environment. We endeavour to go outside whatever the weather (- with the exception of strong winds and lightning) so waterproof clothing is a must!